Last week I attended ‘Critical Care in the Emergency Department’ – a one-day course run by none other than Dr. Cliff Reid. Resus.me (Cliff’s site) was recommended to me by a senior colleague when I was working in Sydney a few years ago. It was my first exposure to the #FOAMed universe, and the beginning of an awesome journey of inspiration and self-discovery for me, culminating in a successful application for EM training back home in the UK, and my own blog. Needless to say, when I found out the course was being held in my home town, I didn’t hesitate! It was a predictably amazing day of learning, covering post-cardiac arrest care, airway management/RSI (probably got the most airtime), ventilation, shock, neuroprotection, sepsis and trauma. Aided by a workbook, Cliff led the class through complex case-based discussion and exploration of controversial subject matter. Each topic had clear take-home points, along with an ‘action point checklist’ – a how-to guide for making things happen when you’ve got a sickie in resus. The informal vibe allowed for plenty of goosebump-inducing anecdotes from Cliff’s phenomenal career, #medutainment at it’s absolute best. I thought I’d share a few of my favourite learning points from the day. *Images used are slides that I nabbed from Cliff’s awesome slide-deck. I was granted permission and am very grateful! 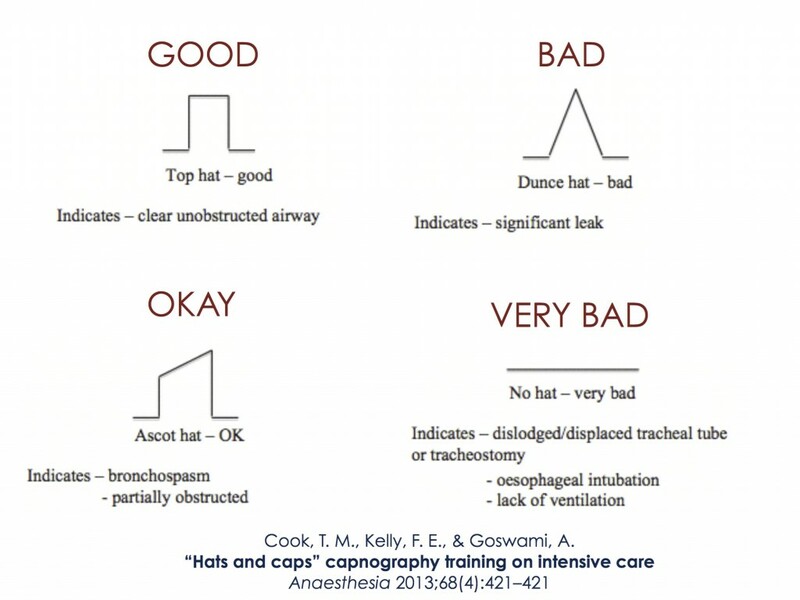 The importance of continuous waveform capnography in all intubated patients was regularly emphasised. Confirmation of tracheal tube placement – in cardiac arrest you always get a waveform if the tube is correctly placed (i.e. never flat – this indicates the tube is not in the trachea). Placement of a tracheal tube is a noxious stimulus – this effects haemodynamics (increased HR + BP) and can increase intracranial pressure. Post-arrest patients will often ‘fight the vent’ (cough on tube, lacrimate). Analgesia and sedation are the first priority in these patients. Only then, should neuromuscular blockade be considered. Here is a great emcrit podcast on analgesia first post-intubation sedation. Key point – positioning is everything. Best position for BVM ventilation and laryngoscopy? ‘ear-to-sternal notch-horizontally aligned, face-plane-parallel-to-ceiling’. 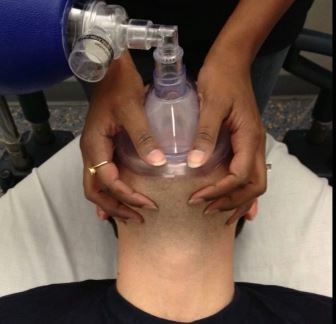 Patients wearing a cervical collar should have an occipital pad (or folded towel) underneath the head to achieve a neutral position. This avoids cervical spine hyperextension, makes the patient more comfortable, and makes BVM ventilation/laryngoscopy easier. I’m currently rotating through anaesthetics at the moment, and there seems to be a lot of importance placed on learning one-handed BVM technique (the ‘CE technique’). In resus, it would be unusual not to have another pair of hands available, and so it makes sense to me to focus more on perfecting the two-handed technique where proper jaw thrust is possible – a more reliable method in difficult-to-bag patients. Perform ‘epiglottoscopy’ – identify the epiglottis to orientate yourself. Once you see it, you know where the cords will be. Struggling to get a good view? Don’t forget apneoic oxygenation – ‘it’s taken all the fun out of RSI as you have so much time’ according to Rich Levitan, who was credited frequently on the course. I’ve blogged on the subject before, so this was music to my ears. 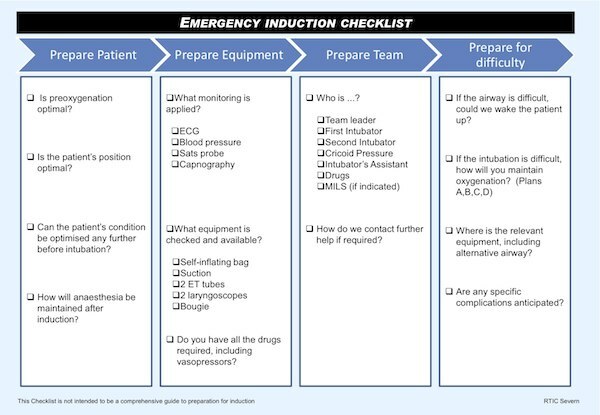 A challenge-response checklist during the pre-oxygenation phase prior to an RSI safeguards against avoidable error, ensures adequate contingency planning, and gets the whole team on the same page; a ‘shared mental model’ is seamlessly achieved. It’s a no brainer. There are many versions online. They are all very similar and so it doesn’t matter which one your department employs. The above example is from saferintubation.com. In the anaesthetic room, bougies are reserved for Cormack-Lehane grade III/IV views. Most EM docs are occasional incubators, and our patients are less predictable. This begs the question: If getting the tube between the cords is easier when railroaded over a bougie, why would we ever go without in resus? Surely using one for every ED RSI should be our standard of care. At the Royal North Shore Hospital in Sydney, use of a bougie (or stylet) during ED RSI has been made mandatory, as part of an ‘RSI bundle’. They have demonstrated improvement in first pass success and reduced complication rates since it’s introduction. Incidentally, the bundle includes an RSI checklist. Perhaps my favourite learning point from the course was another pro-bougie argument: If you use one, there is NO excuse for oesophageal intubation. If you get hold-up you are in the right place. If you keep pushing and there is no hold-up you are in the oesophagus. Simple. Cliff didn’t go as far as to say that he advocates the use of a bougie for every ED RSI, but my impression is that he believes they should be used for the vast majority. I’d be very interested to hear others thoughts/practices (please feel free to comment below!). The ED is frequently referred to as a ‘dangerous’ when it comes to emergency airway management. We deal with sick, unfasted patients in a chaotic environment, with staff not involved with intubations every day of the week. Particularly in the UK, that makes airway practitioners touchy about using resus as a training environment. The reality is that a large proportion of patients that require ED RSI are physiologically well with normal anatomy and little/no past medical history. Plenty of subarachnoid haemorrhage or TCA overdose patients with a low GCS are very uncomplicated to intubate, representing a perfect opportunity for trainees to have the first and second attempt with laryngoscopy. Employing video laryngoscopy where the trainer can see what’s going on will encourage this process. The ITU is a different kettle of fish of course, but the ED often gets lumped in the same category – this isn’t fair in my opinion (or Cliff’s). Ketamine is a haemodynamically stable induction agent, with a profound analgesic effect. It can also be used as a treatment for severe bronchospasm. Previous concerns regarding ketamine-induced raised ICP have been put to bed in recent years. It is the ideal induction agent for trauma (particularly burns), septic shock and end-stage asthma patients. 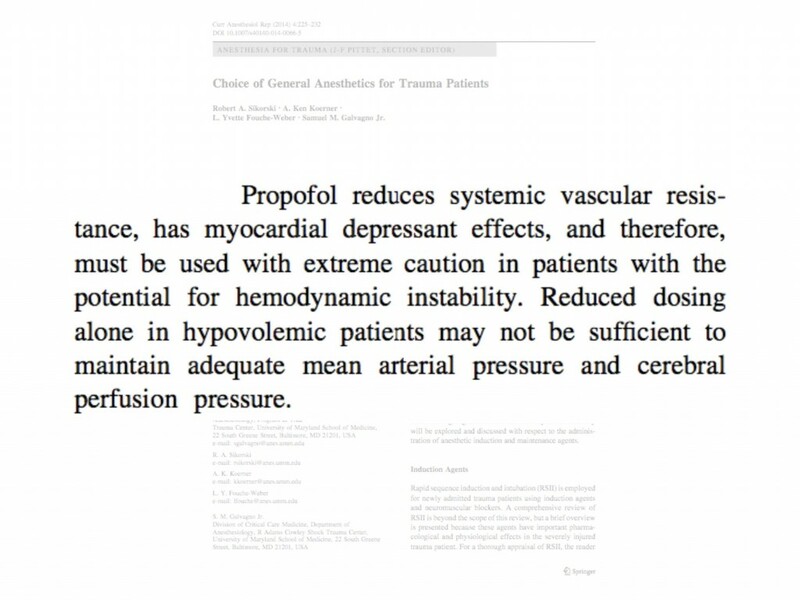 Thiopentone is a cerebroprotective induction agent that can drop the blood pressure – but more predictably than propofol. It’s indicated in haemodynamically stable patients with isolated head injuries or seizures. Take-home message regarding propofol: If they can’t get it right at Shock Trauma, should anyone be using it in the haemodynamically unstable patient? Even at a significantly reduced dose? Probably not. Even if it’s the agent the visiting anaesthetist is ‘most familiar with’. Etomidate isn’t licensed in Australia and so wasn’t given a huge amount of attention. It seems to have fallen out of favour in the UK because of a fear that it causes adrenal suppression in critically unwell patients. This seems a shame as it has a favourable haemodynamics profile, and the clinical significance of the adrenal suppression is unclear, and probably overstated. Pulseless Electrical Activity (PEA) is on the same continuum as hypotension – it is the most severe hypotension you can get (i.e. no recordable BP). 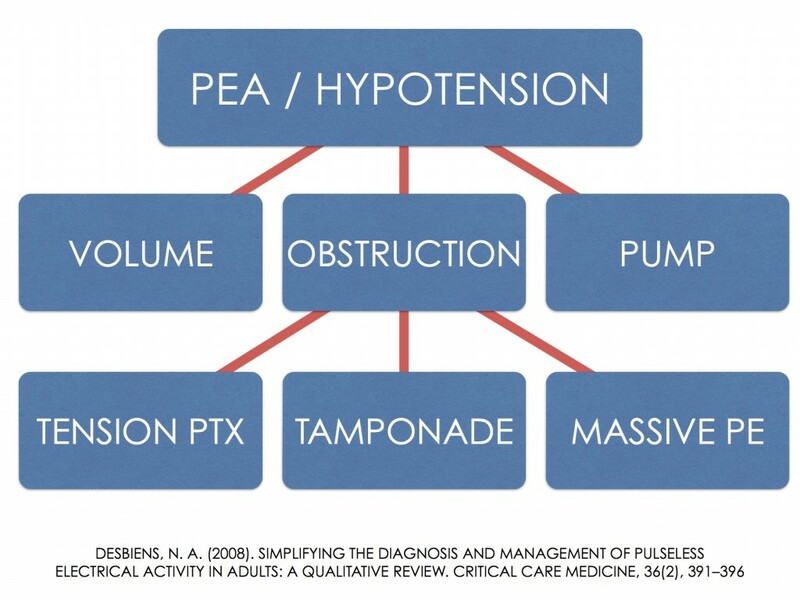 Therefore, the causes of PEA and hypotension are the same, and can be categorised into volume failure, pump failure, and 3 obstructive causes. This is the ‘3+3 rule’, and is far more intuitive than trying to remember the ‘4 Hs and 4 Ts’. Below is my favourite slide from the course. 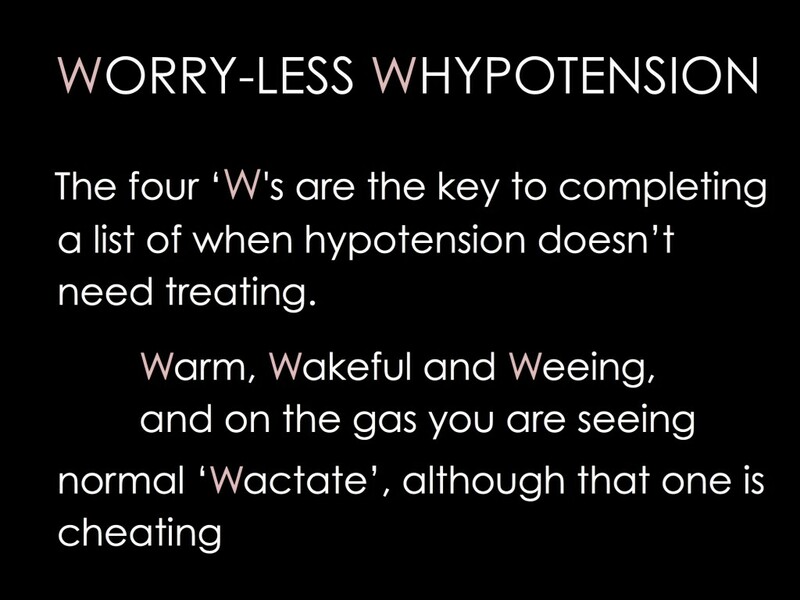 It outlines the hypotensive patients that you don’t need to sweat over. Focused bedside echo is an essential tool to investigate the undifferentiated shock patient – it should lie within the skillset of all resuscitationists. They are fairly obvious if you know what you are looking at. It isn’t a difficult skill to acquire – Cliff suggested it can be learnt in one day! A full RUSH exam (Rapid Ultrasound for Shock and Hypotension) includes other elements of point-of-care ultrasound for a thorough assessment of the undifferentiated shock patient. Think ‘HI MAP’ – Heart, IVC, Morrison’s pouch (+ other FAST exam views), Aorta, Pneumothorax. There is ample material from the FOAMed world to feast on. Here are a couple of awesome videos from the Ultrasound Podcast, where Scott Weingart walks us through the full RUSH exam (first video – ‘H’, second video – ‘IMAP’). A high lactate very often means ‘badness’, but not always. It is important to appreciate that there are multiple causes of a high lactate – several of which are relatively benign. 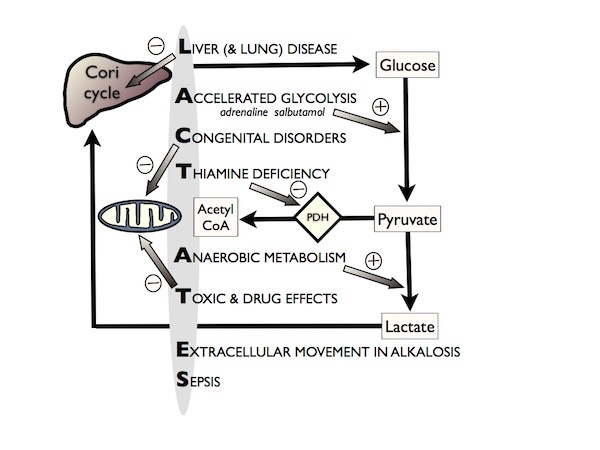 Another great visual aid from the course was this diagram explaining all the causes of a raised lactate. Learning this back-to-front will safeguard against embarrassing myself in front of the medical registrar in future. Fabulous stuff. As I’ve mentioned, I would love to hear others thoughts on any of the topics I’ve discussed, or if any fellow #critcareED alumni would like to share their own highlights from the course that would be awesome. Thanks again Cliff for an fantastic day of learning!